Summary: Buckle up, because this is the Young Sheldon crossover episode. Sheldon is having a crisis after discovering his Nobel Prize-worthy paper was debunked a long time ago. He’s questioning everything in his life, including tea, which he calls “leaf soup.” Leonard is like, oh, I know what will help, let me open up my... secret safe hidden in the wall??? 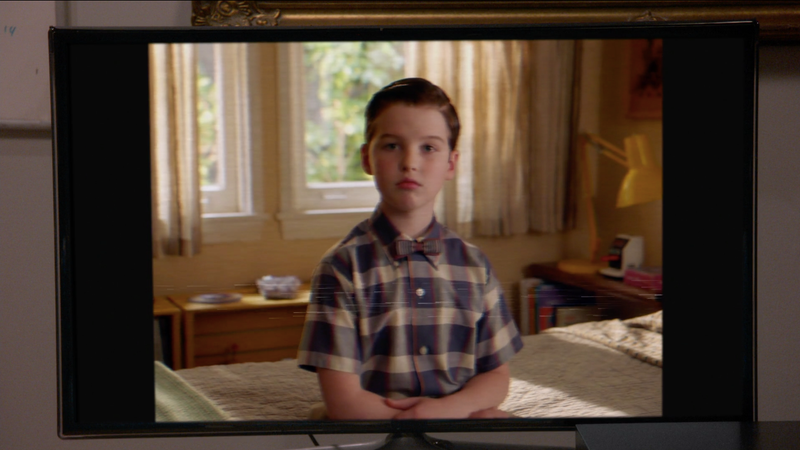 He pulls out a VHS tape featuring thee Young Sheldon, who recorded this tape as a child so that when future Sheldon got stressed he could watch it and believe in himself, I guess. Sheldon settles into watch his babyfaced self school him (“I’m so smart,” he says, watching himself) but the most important part of the tape was already taped over with his dad’s old high school football game. Ugh, football ruins everything. The group decides to have an extremely chill Viking funeral for the paper because Leonard’s mom, crucially played by Christine Baranski, suggests they should because Sheldon is in mourning. This is incidentally what I do as well when my blogs for Jezebel get rejected. Sheldon also ends up watching part of the football game tape, which includes his football-coach dad giving an inspiring speech, which helps him feel better. In the other storyline, Howard discovers an old audition tape of his for the Magic Castle. Personally, and I don’t care if you judge me, I would genuinely die if I got to go to the Magic Castle, an extremely elite society for magicians and magic enthusiasts in Hollywood. Only members and their guests can get in, and I am sad to admit I am neither of those things. I feel like the few times I’ve seen magic, I go in a grump and then leave with tears in my eyes over grown men making eggs disappear into coat pockets. I hate myself for it, but I can’t change who I am, okay? Anyway, Bernadette takes on the role of pageant mom to coach Howard into auditioning again. She puts him in a tacky velvet suit and gives him this awful song and dance number. Howard hates the act, but when he does eventually audition for the castle, he smashes a judge’s Rolex into pieces. Whoops. Worst joke: Sheldon calls flags “the strippers of the emblem world.” Sit with that. Nerdiest moment: Amy and Sheldon realize, in thinking about his strange relationship with his father, that their theory might actually have weight. “From one viewpoint, you and your fathers’ lives are asymmetrical, but from another vantage point, they’re symmetrical,” Amy says, pacing across the room, deep in thought. As a big fan of googling celebrity heights, I found that Jim Parsons is apparently 6' 1, and yet that doesn’t seem so tall. But when you take into account that Mayim Bialik is apparently 5' 4, Johnny Galecki is 5' 5, and Kaley Cuoco is 5' 5 and 3/4 (why Celeb Heights could even get this specific disturbs me), it starts to make sense. Basically, what I learned is that I am taller than most of the cast of The Big Bang Theory, because I am 10 feet tall, not unlike Slenderman. How dead is this show? : I thought it’d be dead by now, but I keep hearing its heartbeat thumping through the walls of my apartment as if I were the character in an Edgar Allen Poe novel. Crazy!